10% OFF Greensbury Market with the WHITSWAY discount code! This week I’ve teamed up with Greensbury Market to share with you their well-sourced meats. I’ve been a customer for a while now and was so happy to hear they were fans of Whit’s Way too. Their products are delicious, healthy and so helpful for family meals. They come frozen and perfectly portioned. Greensbury has some of the highest quality meats and seafoods I’ve come across. I always leave a whole chicken, a few chicken breasts, skirt steak, salmon and their chicken thighs in my freezer for those times when I haven’t shopped or planned for dinner. If you have not tried to put a chicken in the Instant Pot, you are missing out. It is the best roasted chicken I make. It does take a little adjusting to the process and it is not quite as pretty but that is because it falls off the bone. The flavor is just so good! The whole chicken is by far the most useful and versatile meal I cook in my home. I normally do it on a Sunday because it takes an hour or so. In the two days that follow, I make tacos, chicken soup, throw it on a salad for my lunch or make a chicken salad with it. 1 whole chicken - rinsed and giblets removed 3-4 lbs. Saute the garlic and onion in olive oil for about 5-7 minutes on the “Saute” setting of the Instant Pot. You want them golden brown, for added flavor. Add in the whole chicken. Saute for 5-7 minutes on each side until it is slightly brown. You may need to add in more oil. Keep rotating so it does not stick. Place the chicken breast down. Turn "Saute" setting off and add in the remaining ingredients. Lock the lid and set the valve to "Sealing". Select "Poultry" and increase pressure to high. Cook for 20 minutes. Open valve for "Quick Release". Be careful with the steam, it comes out fast. Then open lid and turn the chicken over and cook on the same setting for 15 minutes. Again, depressurize by "Quick Release". Remove chicken carefully, it may fall apart. Place in a baking dish and put in the oven on broil for a few minutes to give it some color and make it crispy. When brown, take it out of the oven and place the Instant Pot ingredients around the chicken and enjoy! Use all organic ingredients, if possible. I first saw this on Mommypotamus and then made it my own. So glad it is a staple in our home! 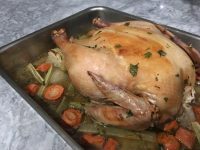 If you do not have an Instant Pot yet, roast the chicken in the oven. Place the chicken in a baking dish with the same ingredients surrounding the chicken. Bake covered for an hour at 375 and then uncover for another 15-30 minutes, depending on the size of the chicken. Enjoy! See below for quick weekday meals with the leftover chicken.